“Moonrise Kingdom” is by far the most enchanting and charming movie that I saw in 2012. It is a great pleasure to have the opportunity to host Gerald Sullivan, the art director of this wonderful production, and to ask him a few questions about his craft, and his work on the movie. Gerald: I am a graduate of the Southern California Institute of Architecture, SCI-ARC. I began working as a set designer in ’95 without much prior knowledge of film making. Since then I’ve had the good fortune of working on a variety of films, gaining insight from many great production designers and working with some of the industries most highly regarded directors. Kirill: In your experience, what’s the role of an art director in the overall production, and what skills do you bring to the table? Gerald: An art director takes on many roles throughout the production. We need to be shape shifters. Initially we need to be able to conceptualize the scenery needed to tell a certain story. Budget and schedule need to be established. The art director has to be able to react, adjust and respond to inevitable changes through out each project. We are in constant contact with the assistant directors, the UPM [unit production manager], construction, set decoration, SPFX [special effects], the Director of Photography, the key gaffer, the key grip, etc. Every art director I know has an appreciation for art, architecture, decoration, and the history of each. The best understand we must be learning more all the time, constantly expanding our knowledge, what we bring to the table. Kirill: From set decorator to art director to production designer. Is it a natural progression, or just one path to follow? Gerald: No natural progression, no one path to follow. Doesn’t need be a progression that aims toward, or ends up at, production designer. Whatever your best at, and take pride in doing, that’s where you should be. Kirill: How did you end up working on “Moonrise Kingdom”? Gerald: I had worked with Adam Stockhausen on a film the previous summer in Michigan. We got along well. I am a big fan of Wes’s work. 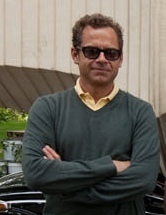 Adam had worked with Wes on “Darjeeling Express” and a few commercials as an art director. When Adam let me know he was going to work on “Moonrise” as production designer, I let him know I was interested in art directing. On the set of Bishop family house. Photography by Niko Tavernise, courtesy of Gerald Sullivan. Outside shot of Bishop family house. This extension was built to match the house and provide the director with what he needed for each scene. It also camouflaged a non-period sun room. Kirill: How much research was done to define and finalize the exteriors and interiors of various sets? Which one was the most demanding? Gerald: Wes had a lot of research done while he was writing. Adam and I compiled a massive amount as well. When Wes decided on the areas surrounding Narragansett Bay, Rhode Island, we began scouting there and added a lot of reference for interiors and exteriors from that. The Bishop house exterior, Summer’s End, we found on the island of Jamestown. For the interior we used several references, perhaps the main one being the Clingstone house, a house perched on a rocky outcropping by the mouth of Narragansett bay. The Clingstone informed many of our interior choices that are seen in the opening scenes. Shingles on the inside, cool as hell! On the set of Bishop family house. Note the details of each item, furnished by set decorator Kris Moran, to make things believable, always true to the characters’ lifestyle. Photography by Niko Tavernise, courtesy of Gerald Sullivan. Inside shots of Bishop family house. Kirill: Each production has its own style of defining the framework for you and your team to work in. 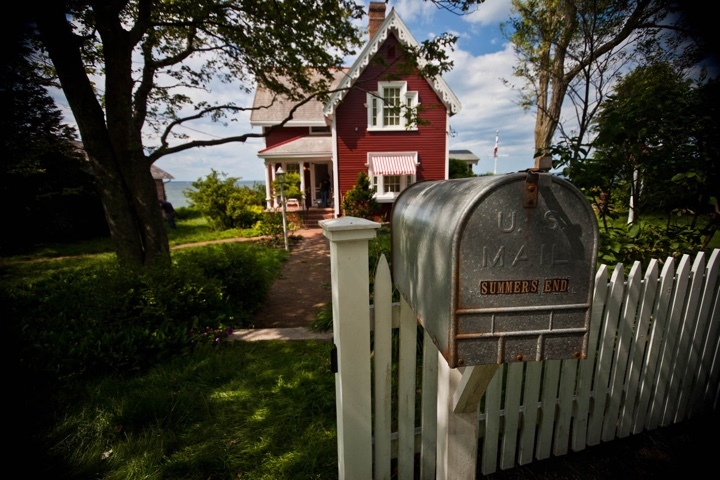 How would you compare the work on “Moonrise Kingdom” to your other productions? Gerald: Wes has his own set of rules or commandments. Wes likes to work independently and not have the production appear as a mega film. Whether it’s limiting the size and number of production vehicles showing up to a sensitive location or whether it’s making sure there’s no over-building of a set, versus building only what we need for an anticipated frame or shot. Wes starts by thumb nailing every shot, literally, he’s meticulous that way and very good at drawing spartan, though informative, postage stamp frames with notes describing each frame and camera move. The thumbnails are then boarded, then made into animatics which inform each scene of the script. On Wes’s films we literally design shot by shot as opposed to designing scene by scene. Very acute. On the set of Camp Ivanhoe. Photography by Niko Tavernise, courtesy of Gerald Sullivan. On the set of Fort Lebanon. Photography by Niko Tavernise, courtesy of Gerald Sullivan. Kirill: What went into the construction of Camp Ivanhoe and Fort Lebanon? 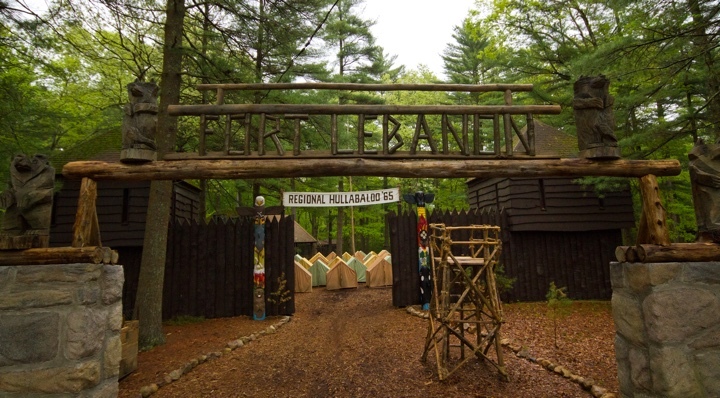 Gerald: With Camp Ivanhoe and Fort Lebanon, we tried to create opposites in terms of scale. 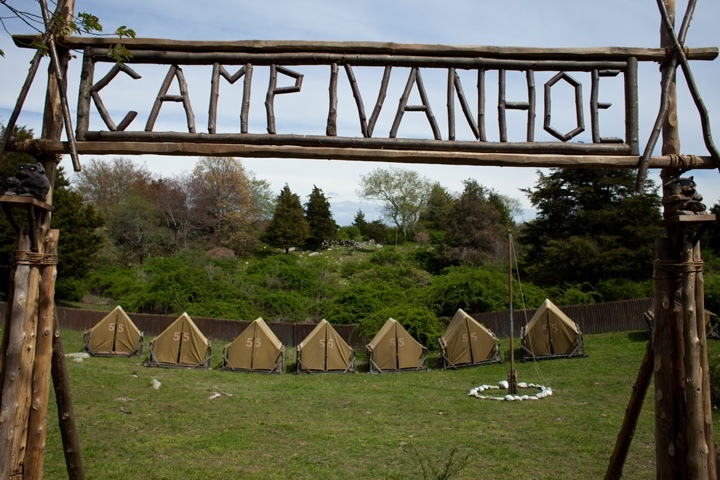 Camp Ivanhoe with miniature stockade fencing and only lonely rows of small tents, sometimes pitched on rolling hills. Fort Lebanon with endless runs of oversized stockade, endless rows of tents, all the bells and whistles. We used an eight foot tall rostrum flanked by the upper tips of a large stockade playing directly in front of camera for the walk and talk that ran for 400 feet. This shot really allowed us to show the scale of Camp Lebanon and introduce us to cousin Ben. Kirill: What was your favorite set, and was it difficult to see it destroyed after the shoots were over? Gerald: I thought we had fun with all of our sets. I particularly liked the sets that introduce us to the Bishop family and how they live. The sets we designed for Wes’s intro to the Bishop house, I liked most… the dolly left, the dolly right, the pull back and the boom up that ends up with us face to face with Suzy on the lighthouse widow’s walk. No difficulty seeing scenery struck, nothing lasts forever, right? Kirill: How different is it to see your sets in the final film? Do you get a chance to enjoy the film on its own without thinking about your specific part? Gerald: Even when you’ve seen each set framed up, even when you think you’ve got a understanding of what’s been shot, it’s always new to see a films final cut. There’s so much that comes after an art directors work is done. From the edit to the score, to the CG adds…yes, always exciting to see the final product. In the case of “Moonrise Kingdom”, I was so enchanted as I watched it for the first time in a theater with my older sister and my niece. I was completely lost in the feeling of the film. I didn’t think of our contributions, just got lost in the story. I’ve seen it several times since then, still enjoy it…wouldn’t change a thing. Kirill: Your work spans productions of various genres and styles. Movies such as “The Dark Knight Rises”, “Last Airbender” or “Minority Report” involve extending and augmenting physical sets with computer-generated ones. 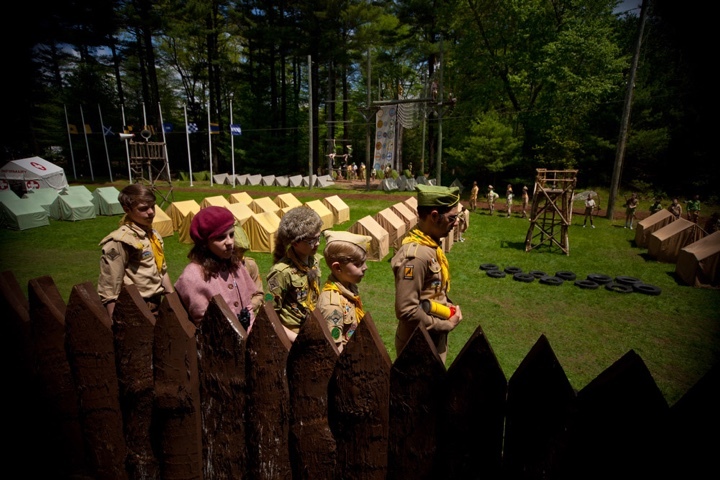 Did you need to be more meticulous on “Moonrise Kingdom” that had only very few CGI shots? Gerald: I think we are equally meticulous and relentless, regardless of a films genre or the amount of CG we need to employ. Digital or analogue, we apply the same design sensibilities. 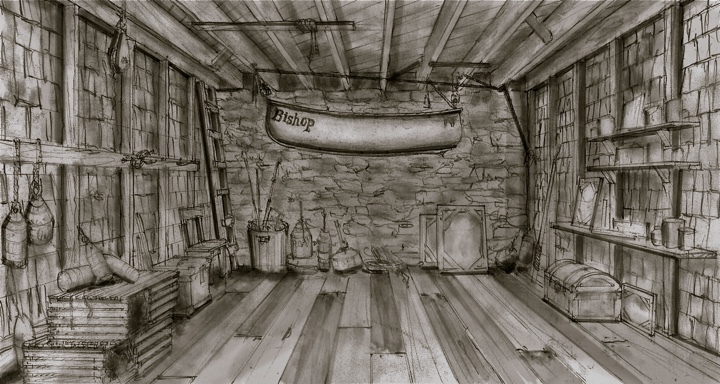 Sketch of boat house. Courtesy of Gerald Sullivan. 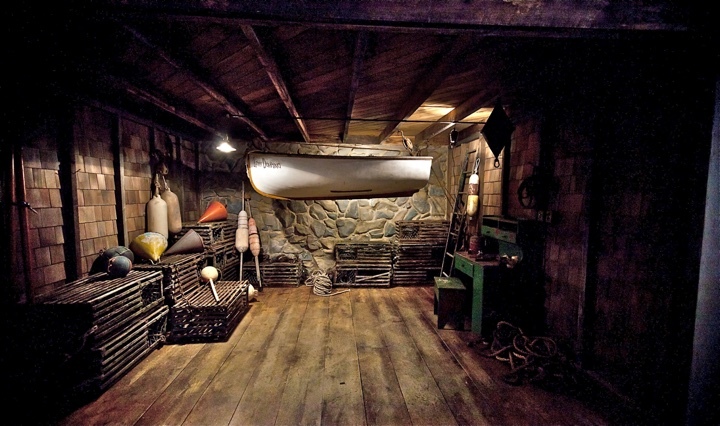 On the set of boat house. Photography by Niko Tavernise, courtesy of Gerald Sullivan. 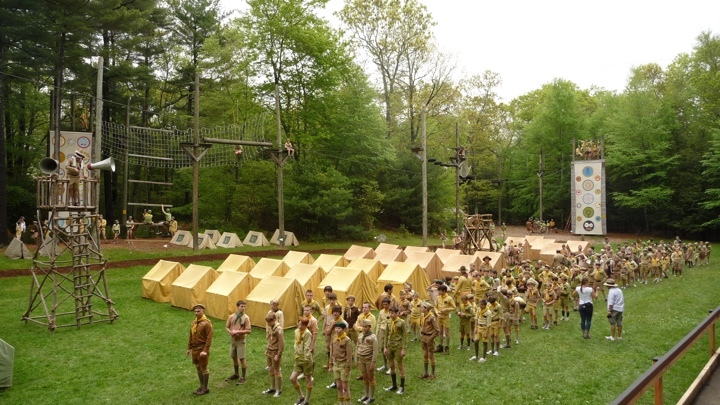 On the set of “Moonrise Kingdom”. 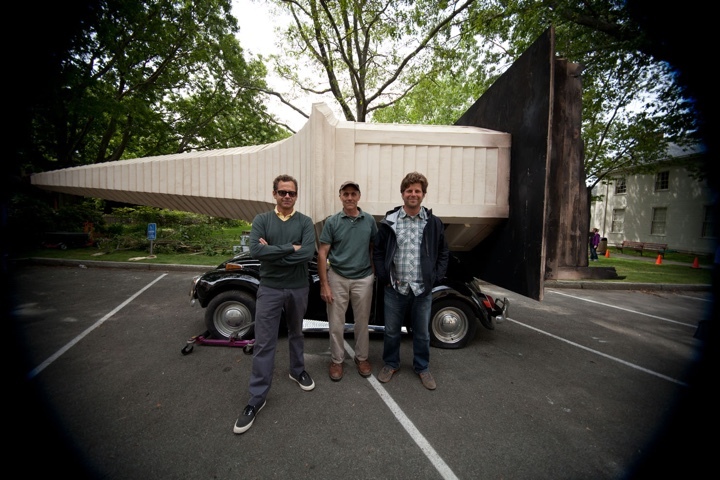 Art director Gerald Sullivan on left, construction coordinator Dave Rotondo in the middle, production designer Adam Stockhausen on right. Photography by Niko Tavernise, courtesy of Gerald Sullivan. Kirill: What are your thoughts on the evolving scope of computer-assisted productions, and increasing number of stereoscopic movies? How is this affecting your craft? Gerald: The technology behind filmmaking will continually evolve. As an art director, we must keep up with all of this and add to our arsenal. I don’t feel we should be limited by one technology or one methodology ever. We should be able to choose and use what we feel is most appropriate for each film, for each story being told. The skills of drafting, model making,(analogue) will always be more important to me than the drag and drop, cut and paste method that has become more common these days. We should all know the difference. Kirill: What’s next for Gerald Sullivan? Gerald: I am currently in Goerlitz, Germany, art directing Wes’s new film, “The Grand Budapest Hotel”. And here I’d like to thank Gerald Sullivan for graciously agreeing to the interview, for sharing the background materials and for finding time in his busy schedule to answer my questions.